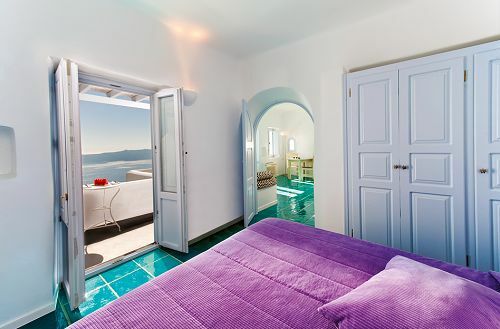 This high standard property offers one of the best views in Santorini, without being difficult to access (a flight of 30 steps and then a flat 10 minute walk – no car access but parking space is nearby available). 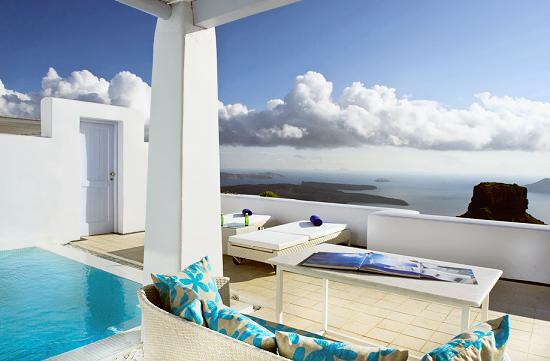 Astra Suites consist of 22 units, all of them built in 1992. All apartments have private bathroom with shower/W.C, hairdryer and complimentary toiletries, a fully equipped kitchenette with cooking rings, utensils and refrigerator, satellite TV, self-regulated A/C (warm/cold), direct dial phone, radio, CD player in all units except the standard apartments, safe box, computer modem access and terrace or balcony with a magnificent view of the Caldera, extending from Oia to Akrotiri. All rooms have double beds, and only the extra beds are sofa ones. In the suites there are king size beds. 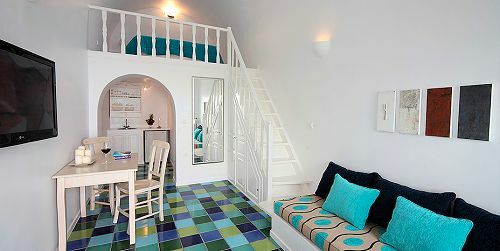 The furnishing is very stylish and various artefacts and antiques decorate the spacious rooms. The standard apartments consist of a separate bedroom (some with loft), a living room area, while the superior apartment has a more spacious living room (some with loft). The two-bedroom apartment has two separate bedrooms, a spacious living room area and two bathrooms with showers. The Senior Astra suite has one bedroom, a large living room featuring the works of local artists and dining area in the kitchen. 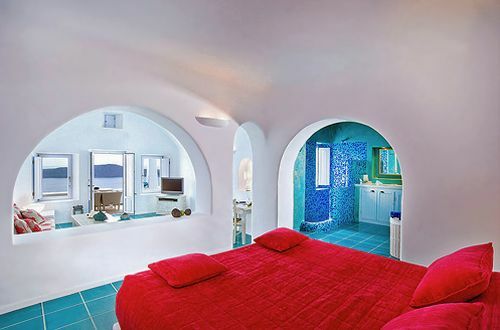 The Honeymoon Astra Jacuzzi suite has a spacious living area with works from local artists, a cosy reading nook, a bedroom with king size bed, spacious bathroom and dressing area as well as an outdoor warm/cool Jacuzzi for two overlooking the Aegean Sea. 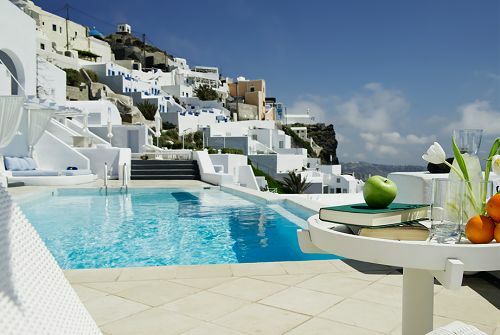 Last but not least the Deluxe Astra Pool suite consists of a spacious living room with local art work, a cosy reading nook, bedroom with queen size bed, a spacious bathroom with dressing area and a panoramic veranda with its own private “infinite” swimming pool overlooking the Aegean Sea. 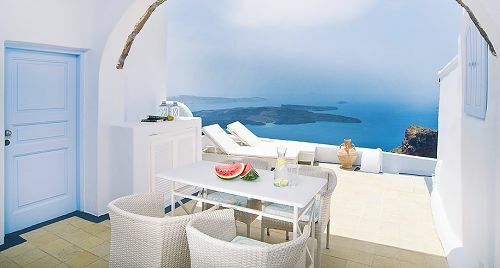 General hotel facilities include a reception housed in an original cave house, a breakfast room by the pool where rich, home-made continental breakfast is served, a medium size swimming pool with umbrellas and sun beds, a pool bar with snacks, and a restaurant preparing light meals. The hotel offers various services including a multilingual 24 hours reception desk, fax facilities, laundry service, baby-sitting (needs prior arrangement), assistance with luggage (if the hotel is informed in advance of the arrival/departure times), and an extra room where people arriving early or leaving late can store luggage, get some rest or have a shower. Cleaning service and change of towels are made daily. Sheets are changed every second day. Small and well-trained pets are allowed. Internet access is free of charge for all guests. This hotel was amazing and the views took our breath away. Service was fantastic and rooms were clean, big and comfortable!